If you are reading this article, it is because you are a compassionate person who loves animals. There’s no doubt about it but you might also be a busy person who fears that organising an event can be a daunting experience. 1) ‘WORKING LIKE A DONKEY’ – Organise a fundraising event at your workplace. Most companies encourage their employees to get involved in charity events and even reward those who do. You could either give your colleagues the opportunity to leave their suits at home or provide a lunch buffet along with our WAD leaflets. It will raise some donations for your favourite animal shelter/ charity or even for World Animal Day. 2) ‘KINDNESS FOR KIDS’ – Arrange an activity for children or young people to develop compassion from a young age. A parade, a street play or even a gathering can be easily organised and prove most effective. And yes, education is the most powerful weapon that you can use to change the world so make sure the children learn about animals. 3) ‘THE FIRST STEP TOWARD CHANGE IS AWARENESS’ – Why not bring an animal-related issue to the attention of others, either in your local community or online to a wider audience? Recognising that most animal events usually only draw the attention of animal lovers, several young voluntary workers of HSAPF Taiwan decided to reach out of the ‘animal circle’ and touch more people to make them aware of World Animal Day, animal rights and local animal welfare through the month of October. We found their video very inspiring. Do you? NOT AVAILABLE ON OCTOBER 4TH? Don't worry if you already have plans for 4th October! of Assisi, the patron saint of animals. that date. Please make the day and date clear in your advertising. 4) ‘CRUSADER FOR A DAY’ – Fancy being a campaigner for a day? Why not send a ‘World Animal Day’ greeting card to political influencers about local animal welfare issues? 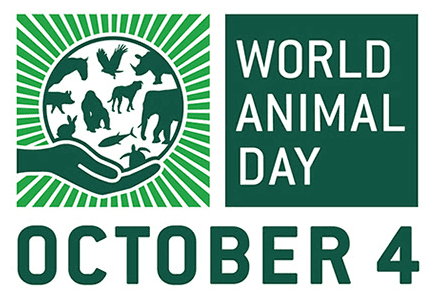 Feel free to use the World Animal Day logo at every opportunity – you will find it in the link below. Please contact us if you need the EPS version. Resources - logo, posters, leaflets and flyers. 6) ‘TIME IS AS WELCOME AS MONEY’ – Volunteer at a local animal shelter or animal charity. Make a difference in your community and be a superhero for the animals. Whether you walk dogs at your shelter, stuff envelopes for an educational mailing or assist with a fundraising event, you can make a difference in the lives of animals. How will it feel to be part of a solution? 7) ‘VEGAN FOR A DAY’ – Give up meat and dairy products for a day! If you are not vegan already, why not give it a try? Encourage your friends and family to sponsor you and use the donations to help the animals. The animals are worth it! Please join hands with everyone who cares about animals around the globe in celebration of this special day. World Animal Day on October 4th is YOUR chance to make a difference! If You Have an Older Dog, You Need to Try These 4 Products!